Adding and managing notes to texts simplified. We no longer provide support for Annotations but it can still be downloaded for free. Use at your own risk. Annotating documents with highlights and notes can quickly clutter the page. Annotations simplifies adding and managing notes to texts while keeping the documents clear and readable – making it the perfect helper for researchers, students and other data analysts. 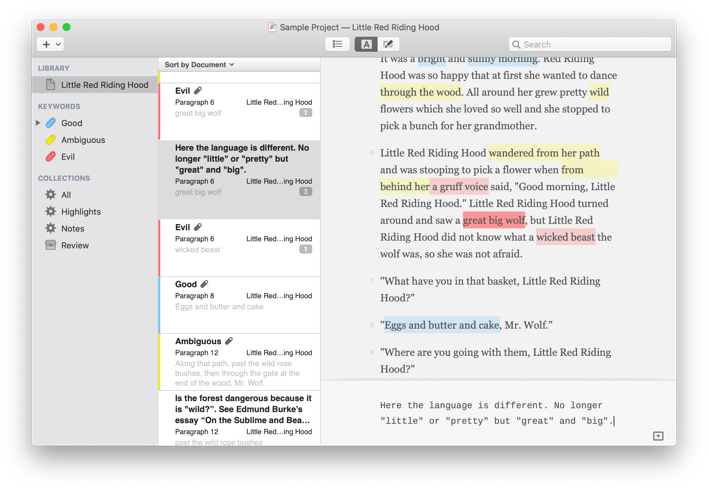 Highlight text with colours, assign custom keywords or add notes of any size quickly and effortlessly. Make a text selection and have all annotation options available right at your fingertips. A built-in auto-completion matches existing keywords as they are typed. Highlight or add notes to entire paragraphs, sentences or words. Even multiple separate text selections can be assigned to a single annotations. Whenever it's necessary to just look at a subset of annotations, it's easy to organise and filter them. Add annotations to custom collections or show them by document, type, keywords or matching search criteria helps to focus on the right annotations at a time. Annotating documents is sometimes not enough. That's why Annotations allows you to add keywords or notes to other annotations, too, while remaining clear and easy to understand. Add any text or Microsoft® Word document to your project. And if you find a typo, don't worry - you can edit them right within Annotations. View and export only what has been highlighted or provided with notes. Whether it's for team discussions or another part of the workflow – simple yet comprehensive formatting options make it easy to tailor summaries at any given opportunity.